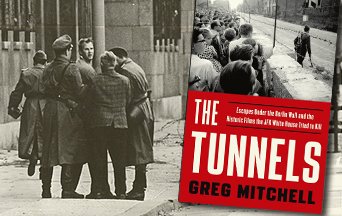 The book, The Tunnels by Greg Mitchell tells an incredible Cold War story about the determination and courage of people oppressed under communism. Many people under forty or even older, probably are not even aware of why these tunnels were dug. This is the story of tunnels dug by hand under the Berlin Wall. It was done at great personal risk to escape from the Soviet-conquered East Berlin. At the end of the tunnels was freedom in allied-controlled West Berlin. The author describes the horrific conditions of life in East Berlin after the War. It was run like a concentration camp by Soviet communists and their new-found East German communist comrades. Many of the things the West took for granted were scarce in East Berlin, especially freedom. Daily life under communism was oppressive. Anyone could be arrested at any time, sent to a concentration camp or even face execution. The contrast between East and West Berlin forced the communist authorities to build the Berlin Wall. It was simply too easy for East Germans to look beyond the armed checkpoints and observe the better life of their fellow countrymen in West Berlin. And it was also easier to escape when no wall stood in the way. Due to the great numbers of those fleeing communism, the Wall was built and manned by soldiers. It was surrounded by land mines and barbed wire barriers. Orders were given to shoot on sight anyone attempting to flee. Those shot would often be left to bleed to death in the open. Many were blown to bits by landmines, shot on sight, or arrested and dragged away to a terrible fate. Fleeing communism also endangered the families and friends of defectors that were sometimes arrested and imprisoned. From the very beginning, many attempted to escape over the Wall. Many innovative ways included those who pole-vaulted, carried ladders, jumped from windows adjoining the Wall into a safety net held by West German police. One family even made the trip over in a hot air balloon. One group rode on an excursion boat and then forced the East German captain to take them to the West. West Berliners had the courage to assist their fellow countrymen gain freedom. They held nets, tried to distract East German guards and even provided covering gunfire. Sometimes they were successful, sometimes not. The other way to get to the other side was to tunnel under the Wall. The fascinating stories of the many tunnels are a testimony to human ingenuity and the innate desire to be free. This book focuses on those brave souls from the West that risked great dangers to tunnel to bring as many to safety as they could. All sorts of people were involved in the effort. Some tunnelers had family in the East. Others simply wanted to help their fellow countrymen. Many foreigners also helped East Berliners achieve and enjoy the same benefits of freedom. Among these were university students that came not only from Germany but other countries including the U.S.
During the Cold War, the effort was so attractive that a major television network actually filmed the tunnelers in action. The filmers managed to keep the details of the tunneling secret so as not to endanger either the tunnelers or the escapees. The 90-minute film was shown on national television. Not all underground escapes however were successful. Those who were caught were imprisoned and their children and infants taken from them. Sadly, they were sometimes betrayed by moles and spies and the tunnelers paid with their lives. The identity of one paid communist mole was discovered only years after the fall of the Wall. Another obstacle was the United States government policy that discouraged and refused to be involved in escape attempts. This policy was implemented out of fear of confronting the Soviet Union. For this reason, the U.S. even tried to discourage the release of the film. 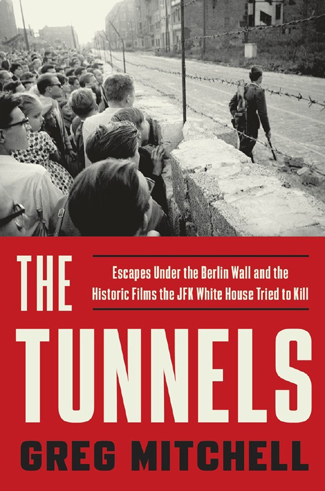 The Tunnels is recommended for anyone who appreciates freedom and wishes to honor the great courage of others. It is also for those who are so concerned about micro-aggressions and other such postmodern inventions. They need to see the brutal face of communism and the Marxist ideas that still circulate in America. This entry was posted in TFP Recommends Books and tagged America, Berlin, Berlin Wall, Book Review, Communism, communist, courage, East, escapes, freedom, historic, honor, sacrifice, Soviet, The Tunnels, tunnel, Wall, west by Francis Slobodnik. Bookmark the permalink.